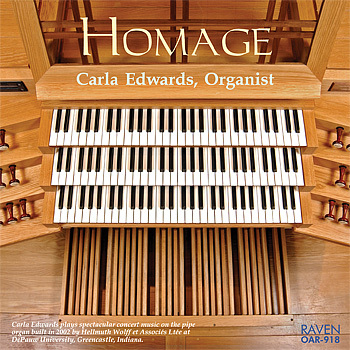 Carla Edwards plays spectacular concert music on the three-manual organ containing 2,848 pipes and built in 2002 by Hellmuth Wolff et Associés Ltée at DePauw University, Greencastle, Indiana, where Edwards is professor of organ. She dedicates the CD as Homage "to Dr. Larry Smith, with sincere gratitude from Carla Edwards." I loved Carla's idea doing an entre disc of music that pays homage to another composer. Very clever! . . . All of the music on this disc is difficult, and made far more challenging by the fact that the organ, the 2002 Wolf organ at DePauw University, is so transparent! . . . This organ has a remarkable amount of character to it. Carla found one excellent registration after another. I was mesmerized by its tonal character. Second, Carla's playing was nothing short of brilliant. This music is seriously difficult, but it comes across as being exuberant and fiery." Caria Edwards, professor of organ at De Pauw, recorded this recital on 'home soil', utilising the 2002 Helmuth Wolff organ (III/41) in the gracious acoustics of Kresge Auditorium. Edwards plays a varied programme which pays homage to earlier people or styles, the repertoire juxtaposing well-known fare (BWV 593, Durufle sur le nom d'Alain) with more obscure (but nevertheless fine) offerings by Joel Martinson, Samuel Adier and the underrated Passacaglia quasi Toccata na tema -BACH by Milos Sokola. . . . the organ sounds well with the flexible winding adding just enough character without being disturbing in the 20th-century pieces. Caria Edwards plays with integrity and musicality; tempi are well considered and there are no shallow gestures. . . . Warmly recommended. How many ways are there for musicians to honor their musical predecessors? The works on this CD demonstrate the wide variety of methods composers have employed to quote, build upon, or pay respect to the works of previous composers. The B-A-C-H theme used by Miloš Sokola in his Passacaglia quasi Toccata na tema BACH employs the German musical names of notes which differentiate pitches B-flat (as “B”) and B-natural (as “H”). Thus, in German, each letter of Bach’s name corresponds to a single pitch. J. S. Bach used the theme in his own Die Kunst der Fuge (BWV 1080) and achieved what many musicians aspire to—he literally became the music he was composing. The theme was taken up by his son (Johann Christian) and then by later composers who often wrote in Baroque forms—specifically fugues by Franz Liszt and Robert Schumann. Sokola was a twentieth-century Czech musician who worked most of his life as a violinist in the Prague National Theatre orchestra. His piece thus pays respect not only to J. S. Bach himself and the forms of the Baroque era, but also to the tradition of paying respect to Bach in music. The Organ Concerto in A Minor (BWV 593) is J. S. Bach’s homage to Antonio Vivaldi. In an age before recording and when printed music was relatively rare, musicians learned new works through copying and arranging pieces they wished to study. Bach’s transcription of a Vivaldi violin concerto gave him insight into such things as Vivaldi’s approach to instrumental style, the concerto as a form, and orchestration techniques. The act of transcribing a violin concerto for the organ also forced Bach to confront the differences between the instruments. Careful listeners may note a number of passages in which Bach was forced to re-compose Vivaldi’s music to fit the organ’s abilities. Most people familiar with J. S. Bach’s biography know that as young man he walked 250 miles from Arnstadt to Lübeck to hear Dietrich Buxtehude perform—an act of homage few today would consider repeating even for our most beloved mentors. In Lübeck, Bach heard an organ virtuoso of the highest caliber whose chromatic innovations were to greatly affect his own works. But perhaps just as important, Bach saw a professional model in the central role Buxtehude occupied in the cultural life of the city with his Abendmusik concert series—a model he was to emulate most successfully later in his life at Leipzig. The Passacaglia (BuxWV 161) is in four large sections and, within each section, the pedal ostinato is repeated seven times. Minor (BuxWV 148) in his work. He weaves these motives into the five-part North German toccata form which alternates toccata with fugal sections as follows: toccata—fugue—toccata—fugue—toccata. Given the organ’s traditional role in liturgical music, it is only to be expected that some organ composers would create works in imitation of the spoken liturgy. Joel Martinson (b. 1960) is currently Director of Music Ministries and Organist at The Episcopal Church of the Transfiguration in Dallas, Texas. His Litany (2000) is in a broad ABA form. Just as a litany as a prayer is characterized by a repeating motif (such as “Lord have mercy”), the central section of Martinson’s Litany is characterized by a repeating theme of increasingly larger intervals. The theme repeats several times with successive transformations of color, range, and dynamics. The theme of the brief, reflective A sections uses wide intervals around a central pitch, creating a bond of similarity to the central Litany theme at its most developed point. The work also pays its respects to Alain in a quotation from his famous work, the Litanies. Stepping back even further, Duruflé seems to be going out of his way to also pay his respects to J. S. Bach by composing his memorial to Alain as a prelude and fugue — a pairing of forms for which Bach is most famous. Like many dances, the origins of the rumba are obscure despite its popularity. In its folk origins, the rumba is based on repeating basic rhythmic patterns (usually played on percussion instruments such as congas) that support free, impro­visa­tory embellishment by singers. This type of rumba served as the musical background to a paired dance of playful romantic conquest. In his Toccata alla Rumba, the Viennese composer and organist Peter Planyavsky does not necessarily rely on either the traditional rhythmic patterns or the sense of improvised embellishments, but rather, evokes the feel of separate dancers through different themes and voicings whose playful interactions are framed by a broad, repeating fanfare. When writing for the organ, I am always inspired not only by my teachers but especially by the teacher of us all—J. S. Bach.… The Festive Proclamation is a kind of combination of German and French organ music and will, I hope, represent the majesty and power of what we call the music for the “king of instruments.” It was commissioned by the National Symphony Orchestra to rededicate the reconstructed organ at the Kennedy Center and therefore is a rousing work showing the majestic power of that large instrument. It is dedicated to William Neil who at the time was the organist of the National Symphony Orchestra. In response to the opening question, then, it appears that musicians devise many ways to honor their musical predecessors. In every performance of music, musicians pay their respects to those composers, teachers, and audiences who have inspired them. And while many acts of homage are public and obvious, just as many are purposefully hidden and obscure, but they are no less sincere in their anonymity. Carla Edwards is Professor of Organ at DePauw University in Greencastle, Indiana. She received a Bachelor of Music degree with highest distinction from the University of Kansas, a Master of Music degree from the University of Alabama, and a Doctor of Music degree in Organ Performance from Indiana University. Her organ studies have been with Larry Smith, Delores Bruch, James Moeser, Catharine Crozier, Robert Noehren, Michael Schneider, Mary Lou Nowicki, and Warren Hutton. Edwards has performed in the United States, England, Finland, and Italy, and her performances have been broadcast on the nationally syndicated radio program Pipedreams. Dr. Edwards has recorded two CDs for Calcante Recordings, Ltd, two recordings with the DePauw University Band and a recent CD of works for Soprano and Organ with Prof. Caroline Smith from DePauw University. 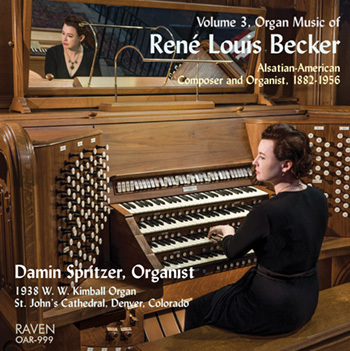 As well, her performance given during the 2007 Organ Historical Society convention is included in the 4-CD set “Historic Organs of Indiana,” published by OHS.